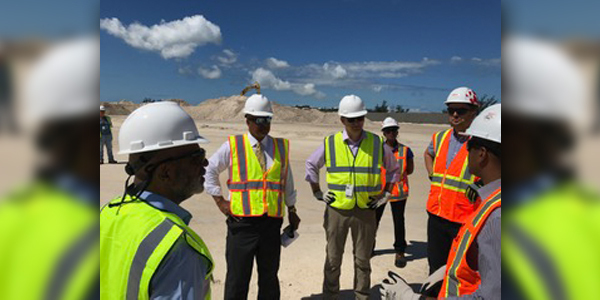 Deputy Premier and Minister of Finance Bob Richards and Minister of Tourism, Transport and Municipalities Michael Fahy recently toured the airport redevelopment site with members of the Bermuda Airport Authority [BAA]. BAA is the Government quango established to oversee the Government of Bermuda’s interests in the current operation and redevelopment of the LF Wade International Airport. BAA is chaired by Mark Fields, retired General Manager of Sol Bermuda and led by Chief Executive Officer Lester Nelson who has more than 25 years of experience in aviation and business management and was the first Bermudian Manager of Air Operations. Mark Fields Chairman BAA, Deputy Premier and Finance Minister E.T. Richards, Minister of Tourism, Transport and Municipalities Senator Michael Fahy , Lisa Wilson Airport Duty Officer Skyport, Connor Smyth Senior Project Manager Aecon, and Sharaz Hack Director, Technical, Skyport. A spokesperson said, “BAA is responsible for oversight of on-going airport operations and performance to ensure accountability to all contractual obligations in the on-going operations and airport redevelopment. Senator Fahy stated: “We had an opportunity to receive an update on the progress of the construction. We learned that it is on schedule and that more than 60 percent of the man-hours worked so far have involved Bermudian labour. BORN BERMUDIANS, get these clowns out of power. They are bad for b—–!! And I hope they turn away anyone that was protesting the building of the new airport.